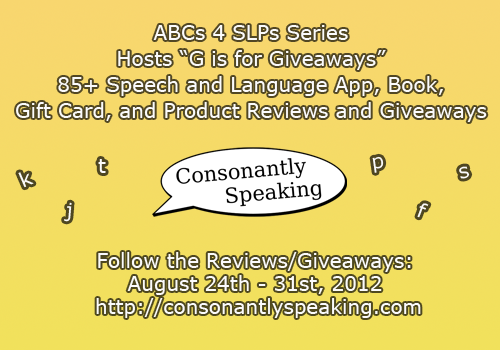 Consonantly Speaking: ABCs 4 SLPs Upcoming Event - G is for Giveaways! When I first started the ABCs 4 SLPs blog series, I thought I would be through all the letters by the end of August. Wishful thinking I guess. I also did not know I would be hosting a giveaway event. When I saw so many peoples' lives impacted by the iPad, apps, and events as well as the community of bloggers and companies helping each other online, I just could not help myself. Ended up coming up with "G is for Giveaways" and figured it wouldn't hurt to ask developers, bloggers, companies, authors, and more if they would be willing to donate an application code, product, book, or material from Teachers Pay Teachers. In exchange, I am reviewing all of the products, books, apps, and more which I hope will help my readers understand all of the hard work that goes into creating an application, book, material, or product as well as understand how each one can be used in speech-language therapy. I hope everyone will follow these companies/bloggers/authors as they have been truly generous to myself and my readers by donating items to give away. I also hope that everyone will thank these wonderful people for what they have done regardless of if they win a giveaway or not. Finally, I hope that they will discover some different products/apps/books/companies/blogger's materials that will work for speech-language therapy and the reviews will help them determine which apps they would like to purchase to use or recommend to others! Now share away!